This easy and flavorful taco cauliflower rice dish cooks in one pot or skillet for a quick meal ready in less than 30 minutes. 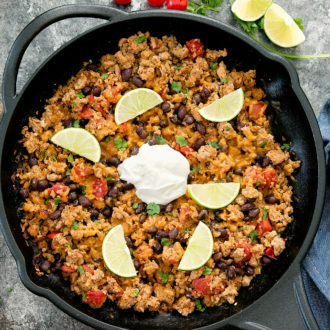 Ground turkey and cauliflower rice is cooked in a homemade taco seasoning and then mixed with your favorite taco toppings like black beans, tomatoes, cheese and cilantro. 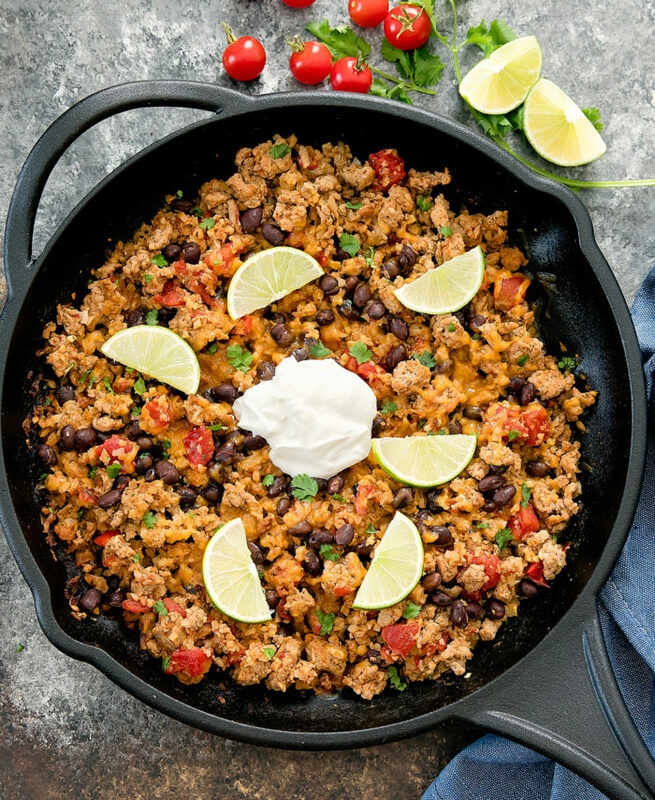 I love one pot meals and this taco cauliflower rice is a new favorite. It’s basically taco filling mixed with cauliflower rice. The end result is so flavorful and tasty. To keep it light, I use lean ground turkey instead of ground beef for my taco filling, but feel free to use ground beef, pork, or chicken. 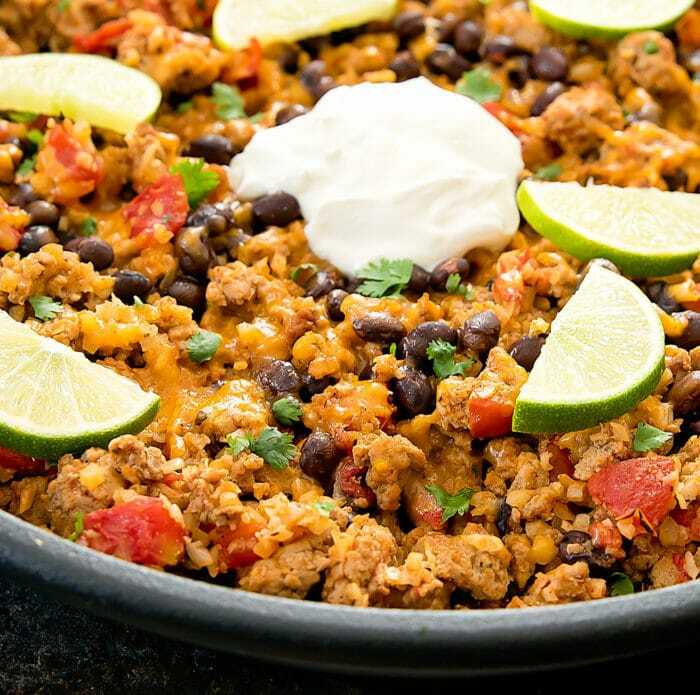 The turkey and cauliflower rice are both cooked in homemade taco seasoning and then mixed with canned diced tomatoes to keep everything moist, and topped with other popular taco fixings: black beans, cilantro, shredded cheddar cheese, lime juice. This one pot meal is perfect for a quick and easy weeknight meal or for your weekly meal prep. I used ground turkey but you can replace with ground beef, chicken or pork. I was not able to find smaller than 14 oz cans of tomatoes and black beans so I used half of each. 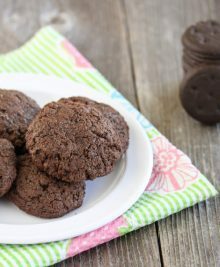 You can save the other half for another recipe or double the recipe to use the full amount. I don’t recommend adding the full 14 oz can of tomatoes as it will make the rice too watery. You can add additional taco toppings like avocados, corn, jalapenos. If you are looking for more cauliflower rice recipes, check out my Garlic Parmesan Cauliflower Rice, Pesto Cauliflower Rice and Mexican Cauliflower Rice. An easy and flavorful meal that cooks in one pot and is ready in less than 30 minutes. 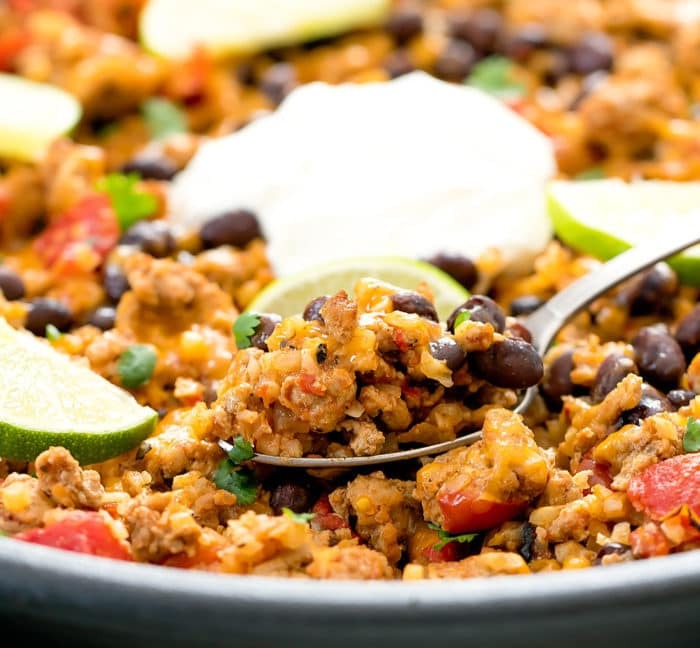 Turkey taco filling is mixed with cauliflower rice and topped with popular taco toppings like black beans, cheese, and cilantro. To make the homemade taco seasoning, add all ingredients to a small bowl and whisk until evenly mixed. Set aside. Keep in mind this recipe makes more than the 3 tbsp required for the taco cauliflower rice, so you can store any remaining unused taco seasoning for another recipe. In a large pan or skillet, add olive oil and garlic and bring to medium high heat. Add onion and ground turkey to your skillet. Cook until ground turkey has browned, crumbling the ground turkey as you cook it. Drain out excess fat. Add cauliflower rice, cooking until tender. Sprinkle taco seasoning across turkey and cauliflower. Add ¼ cup water and 7 oz diced tomatoes (including the liquid) (this should be about ½ of a 14 oz can if you can’t find a smaller size). Stir and cook on medium heat until everything is evenly mixed, turkey is cooked through, and sauce has thickened. Turn heat down to low and stir in black beans. Sprinkle cheese over the pasta. Turn off heat and cover with a lid until cheese is melted. Garnish with cilantro, top with sour cream and serve with lime wedges.